A couple of weeks ago, I made Meghan’s Broccoli Cheddar Quiche for a Sunday brunch. It was amazing!! 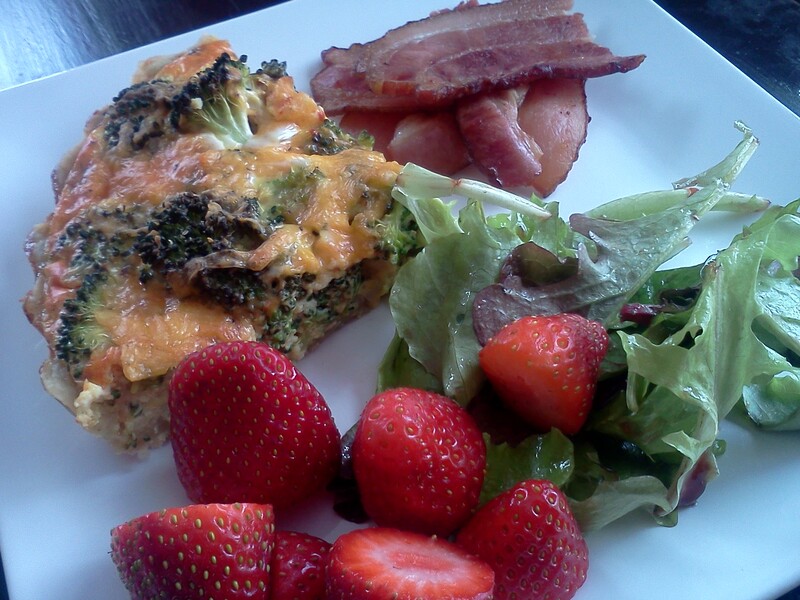 Broccoli Cheddar Quiche with strawberries, bacon and mixed greens. I love brunch! So, back to the fridge! 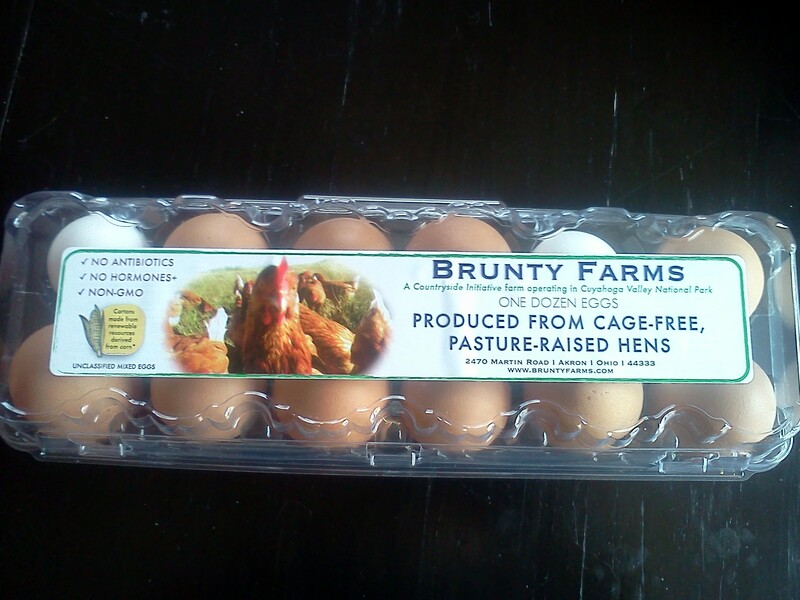 Eggs fresh from Brunty Farms? Check. Milk? Yep. No broccoli, but spinach from the farmer’s market? Check. Onions? Always. Cheese? Ooo…Asiago! Nice. Caramelized onions, spinach, cheese and eggs. How can that be bad? Answer: It can’t. It was awesome. By the time it was done, I was too hungry to make the plate pretty. I’m lucky I remembered to take the picture! Make the quiche crust (or use premade). I made the quiche crust linked above, but I did prebake it for about 5 minutes before filling the crust. (Thanks for the tip, Meghan!) Put the crust aside while you work on the filling. 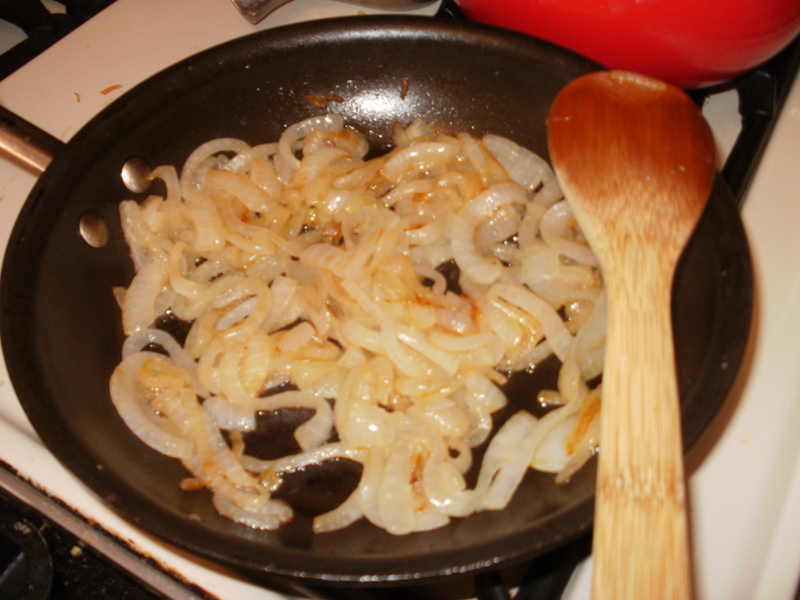 In a medium sauté pan over low heat, add the butter and sliced onion. I added a pinch of salt and let the onions cook over low/medium low heat for about 30 minutes until they were nicely caramelized. While the onions were cooking, I used a fork to whisk together the milk, eggs and spices (pinch of salt, fresh ground pepper, nutmeg, cayenne, ground mustard, garlic powder). I mixed the milk and eggs together in the measuring cup – anything I can do to dirty less dishes is a win. 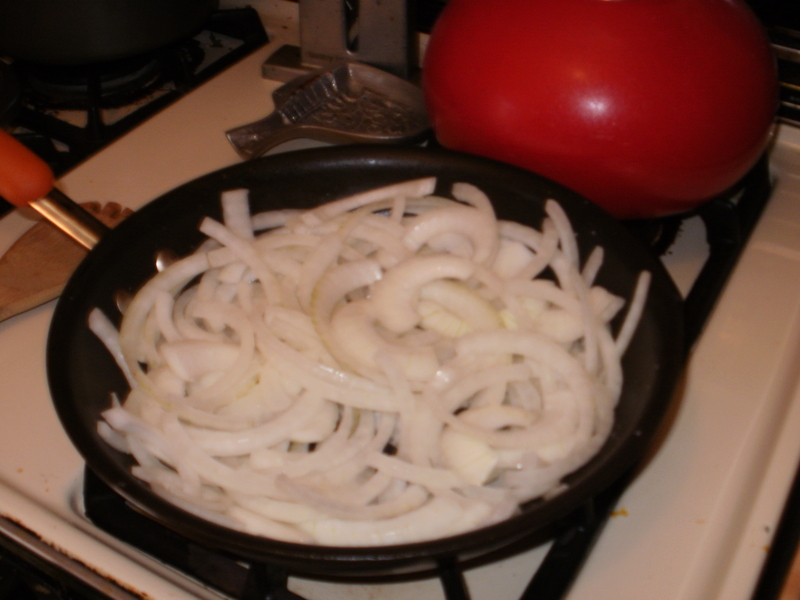 Once the onions were nicely caramelized, I added the spinach to the pan with the onions and covered it for about a minute – just long enough to wilt the spinach. 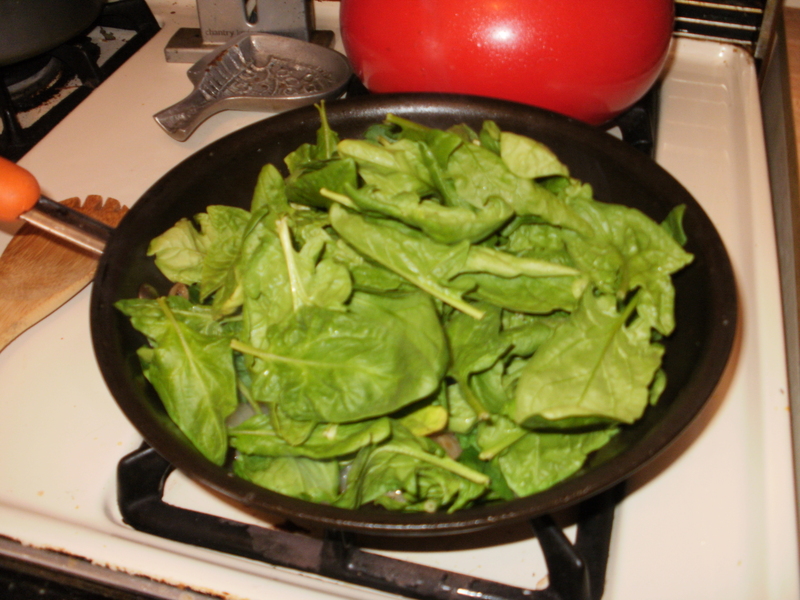 The spinach leaves were small and tender, so I didn’t even bother chopping them up. Once the spinach was wilted but still bright green, I mixed the spinach and onions together and transferred them into the quiche crust. 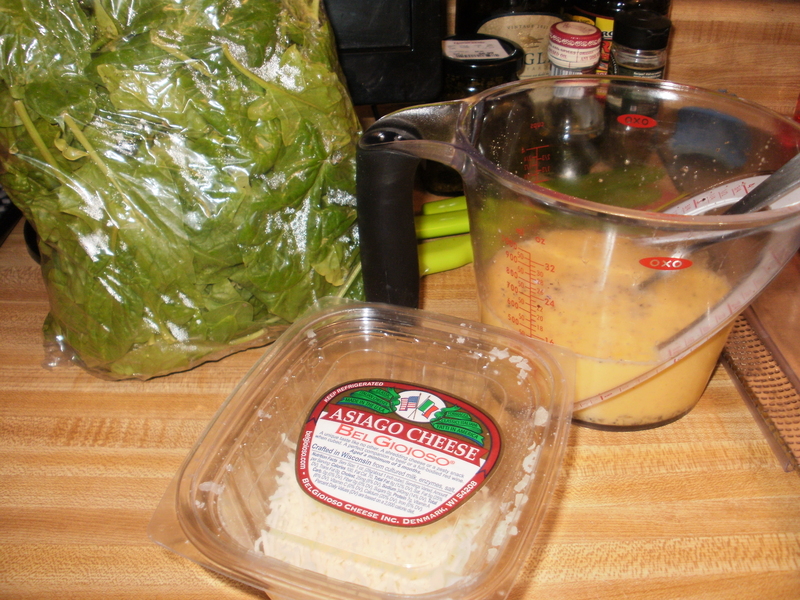 I topped that with the asiago cheese and poured in the egg mixture. I baked the quiche for about 40 minutes in a 350 degree oven, until the top was a beautiful golden brown and the eggs were cooked all through. When it was done, it took all my willpower to let it cool – I was hungry and it smelled really good! As soon as possible, I cut a big piece and dug in. So yummy! The crust was perfect, the onions were soft and sweet, the asiago cheese gave it just a little bite, and the eggs held everything together. I can still call it breakfast if I ate it at noon, right? This post is linked to What’s in the Box? at InHerChucks. 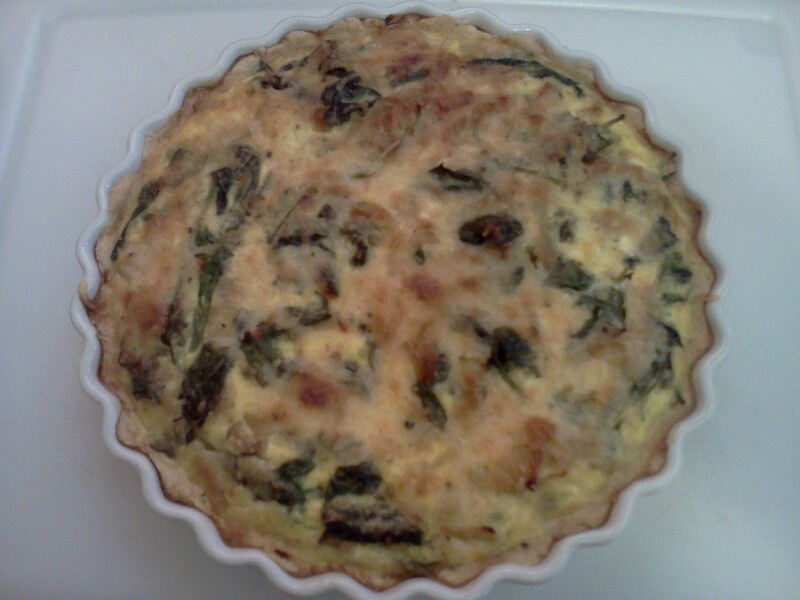 This entry was posted in Breakfast, General, Recipe and tagged baby spinach, breakfast, brunch, caramelized onion, quiche, spinach on April 3, 2013 by Melissa. Both of these variations look delicious! I love the side of greens with brunch as well. Thanks! You would love Meghan’s broccoli cheddar quiche. I love quiche so much too! So many ways to make it. And, yes, great way to use up veggies.I am with Laura , I love the side of greens with it. Hadn’t had that until we went to The Blue Door. Looks great! I’m trying to be better about using up leftovers! Between the pizza and quiches, I’m getting there. Yum! I love the combination and the fact that you managed to sleep in, watch TV, and still have a fresh veggie-filled meal by noon. That rocks! Thanks, Kirsten! It was a good way to start the weekend. You add my quiche!! I think I just got a little misty eyed. I’m so glad you liked it and then went and made another incredible version. Quiches are so versatile, and tell me that crust isn’t ridiculously easy!! By the way, you can absolutely call it breakfast at noon. That’s when I usually eat it on weekends. I’m rarely hungry when I first wake up. Meghan, your quiche recipe was outstanding! And the recipe for the crust – so easy and so delicious! It came out perfectly each time. I wish I had taken a look at my links earlier because I had a beautiful bunch of lettuce from last week and was seriously looking for some inspiration. This dish looks so good I might just have to sneak out to the market and buy another bunch just so I can make it. 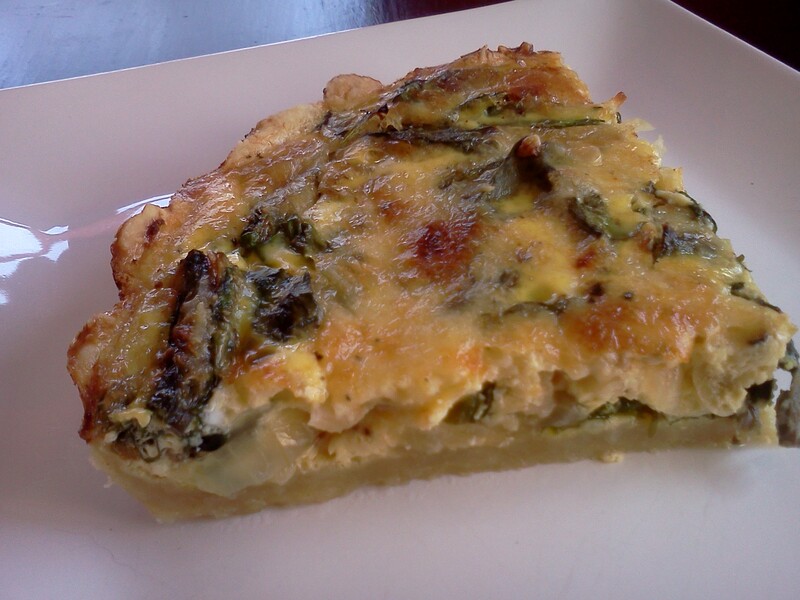 My daughter LOVES quiche and this recipe is sure to be our new favorite. Thanks! I love quiche too, but I never made it at home until I found Meghan’s crust recipe. It’s so easy, but it looks really impressive – I love recipes like that!